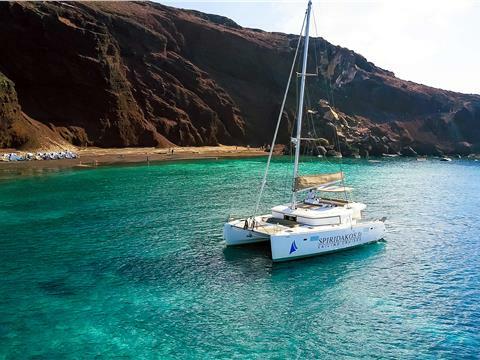 Benefit from hotel pick-up by luxury minibus and journey to Vlychada to climb aboard a private catamaran and cruise to Red Beach and White Beach. Swim and snorkel before discovering the caves of Indian Rocks. 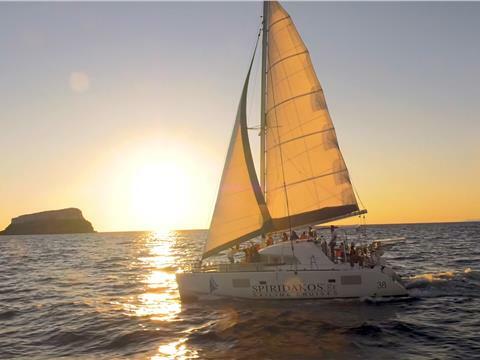 Marvel at the Venetian lighthouse and villages of Fira, Imerovigli and Oia as you sail inside the caldera. Take a healing mud bath in the hot springs of a natural spa, and then continue to a private bay on Palea Kammeni Island. Enjoy a barbecue lunch or dinner prepared by the crew and served with local wine, beer and soft drinks. Return to port and get dropped off at your hotel, or watch a magical sunset before returning to port if you choose the sunset option. It will be the experience of your lifetime.